No longer requires a monthly subscription fee to play. All versions require an Elder Scrolls Online account. Product keys cannot be used to extend subscriptions or unlock additional bonuses on existing accounts. You also cannot purchase the Steam version and apply it to an existing account should you wish to gain access to the Steam feature (e.g. : Trading Cards), you'd need to create a new account. ; Game Time Cards are available for this purpose. 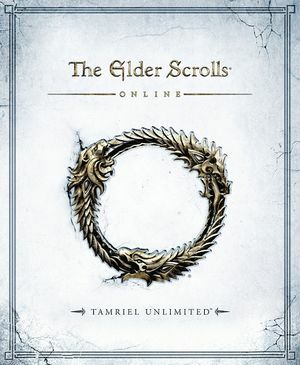 The Gold Edition comes bundled with the base game and the Imperial City, Orsinium, Thieves Guild, and Dark Brotherhood DLC packs. The Imperial Edition includes exclusive in-game content such as the ability to play as the Imperial race. It's also possible to ugrade from a standard edition to the Imperial Edition in the Ingame-Shop. Pre-orders included the Explorer's Pack which had exclusive content such as the ability to join any alliance with any race and special treasure maps alongside with a special pet. This pack is sold separately. Change the SET SkipPregameVideos value to 1. Slider allows values from 70° to 130°. Low FXAA only. Render based AA techniques can't be forced. Nvidia users can force a stronger version of FXAA with Nvidia inspector (remove the AA behavior flags). Capped at 100 FPS by default, see High frame rate. No ingame option. Turns on when HDR monitor is detected. No real HDR support. Use Simple Combat Alerts for combat and Thurisaz Color Blind for item quality indicators. Change the SET MAX_ANISOTROPY value to 1. Per-character keybindings, only Esc is reserved. By default the game does not use mouse acceleration. Master, music, ambience, effects, footsteps, dialogue and interface. Can be toggled on or off. 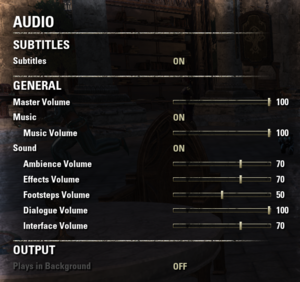 Fan translation by users site «ElderScrolls.Net», download RuESO. No cross-platform play with Xbox One and PlayStation 4 players. See Helix Mod: The Elder Scrolls Online - 3D Vision Fix. 9, 11 Direct3D 12 support is planned for a future update. 2.0 For Windows edit UserSettings.txt and set SET GraphicsDriver.7 "OPENGL"
Both 32-bit and 64-bit executables are present. ↑ File/folder structure within this directory reflects the path(s) listed for Windows and/or Steam game data (use Wine regedit to access Windows registry paths). Games with Steam Cloud support may store data in ~/.steam/steam/userdata/<user-id>/306130/ in addition to or instead of this directory. The app ID (306130) may differ in some cases. Treat backslashes as forward slashes. See the glossary page for details. ↑ Twitter / TESOnline: . 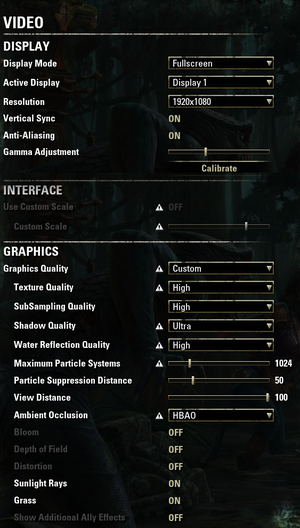 @K95David #ESO's megaserver technology will allow PC/Mac players to play together. Xbox One & PS4 players will have distinct megaservers.